Prime Minister Shinzo Abe said Monday that Japan is committed to its non-nuclear policy and will work toward the abolition of nuclear weapons as Hiroshima marked the 62nd anniversary of the world's first atomic bomb attack, which killed more than 140,000 people in the Japanese city. About 40,000 survivors, residents and visitors from around the world gathered near Ground Zero to observe a minute of silence at 8:15 a.m. Monday (2315GMT Sunday), the moment the American B-29 bomber Enola Gay dropped its deadly payload on Hiroshima on Aug. 6, 1945. An estimated 140,000 people were killed instantly or died within a few months after the bombing. Three days later, another U.S. airplane dropped a plutonium bomb on the city of Nagasaki, killing about 80,000 people. "Japan has been taking the path toward global peace for 62 years since World War II. The tragedies of Hiroshima and Nagasaki should never be repeated in any place on Earth," Abe said in a speech at Hiroshima Peace Park, near the bomb's epicenter. "We will take an initiative in the international community and devote ourselves wholeheartedly toward the abolition of nuclear weapons and realization of peace," Abe said. This year's memorial comes at a particularly sensitive time for Japan. Following North Korea's first nuclear test explosion last Oct. 9, some prominent Japanese politicians have suggested Tokyo should at least debate development of nuclear weapons. Their remarks prompted Abe and other top officials to state Japan will not stray from its three long-standing principles of not possessing, developing or allowing nuclear weapons on Japanese soil. Last month, Defense Minister Fumio Kyuma resigned amid a public outcry over his having suggested that the U.S. atomic bombings may have been justified. During the ceremony Monday, Mayor Tadatoshi Akiba urged the central government to stick to its war-renouncing Constitution. "The Japanese government should comply with the nation's pacifist Constitution as it is and clearly say no to wrong and outdated policies of the United States," Akiba said, without elaborating. Abe reiterated Monday that Japan will remain committed to the country's non-nuclear principles. "We promise that we will comply with provisions of the Constitution, sincerely seek global peace, and adhere to the three non-nuclear principles," he said. In a message, U.N. Secretary-General Ban Ki-moon said nuclear proliferation is "one of the most pressing problems confronting our world." "Today our challenge ... is to make the world safer for succeeding generations. This requires us to continue to work toward a world free of nuclear dangers, and ultimately, of nuclear weapons," Ban said in the message, delivered by Sergio de Queiroz Duarte, the U.N.'s high representative for disarmament affairs. There are about 252,000 survivors of the attacks, according to the health ministry. Many have developed various illnesses caused by radiation exposure, including cancer and liver diseases. Abe, in a meeting of survivors on Sunday, proposed a plan to relax some screening requirements so that more victims can get extensive medical support from the government. Currently only a restricted number of bomb victims meet the criteria for receiving special medical aid. 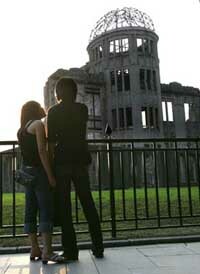 Ceremonies will also be held on Thursday's anniversary of the Nagasaki attack. Japan surrendered on Aug. 15, 1945, bringing World War II to an end.